“We are thrilled to have opened the doors of our flagship store on Piccadilly to the world and to witness the immediate, overwhelmingly positive response from our customers to our brand proposition. We are also grateful to Bosham Capital Advisors for leading the recent highly successful Series B financing for us, and to our existing and new shareholders for supporting our vision for this business”. “We are big believers in the VASHI story and have been deeply impressed at the pace and level of execution that has been achieved over the last 18 months. VASHI is a highly disruptive business model in the bridal jewellery market, building significant brand value and with a very exciting future ahead”. 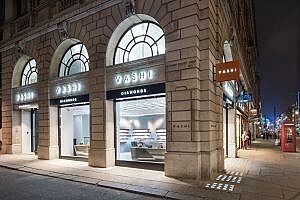 VASHI - www.vashi.com/ - is an aspirational diamond jewellery brand that offers a genuinely unique, disruptive and omni-channel retail experience.